I think one of the coolest creatures created in my generatino was the cloverfield creature for the film Cloverfield. 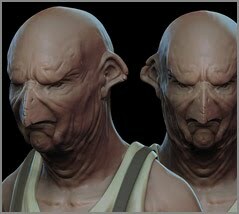 It was really hard to find reference for this guy but I did manage to find a few things and sculpt this up. The feet could be fleshed out more but overall he reads pretty well considering how fast I created him.